Black a appeared in 23 games. 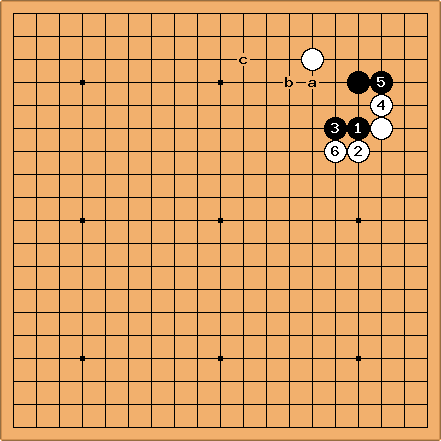 Black b appeared in 58 games. I searched with an otherwise empty quadrant out as far as the neighboring star-points so these games represented double kakari attacks on the black corner stone - rather than replies to a black pincer. 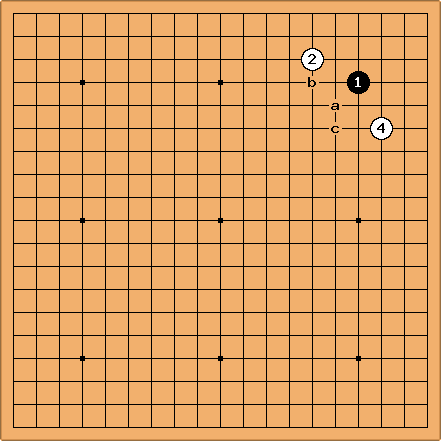 The most popular tsuke nobi variation proceeded through in 21 games. Black replied with in 19 of them (and a in the other two). is the most frequent continuation, appearing in 14 of the 19 games (White b appeared four times and White c once). I was surprised at how frequently this double kakari appeared in the top pro games of the last two years. 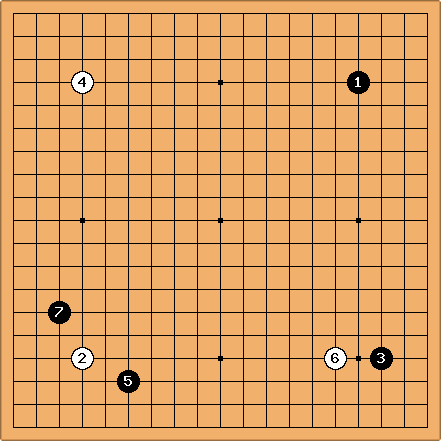 A quick review of the games showed that is mainly due to White's efforts to prevent Black choosing his favorite large-scale fuseki. White plays to deny Black the Kobayashi fuseki. In this and the following example Black may respond to before turning to the lower left. White plays to deny Black the small Chinese fuseki.